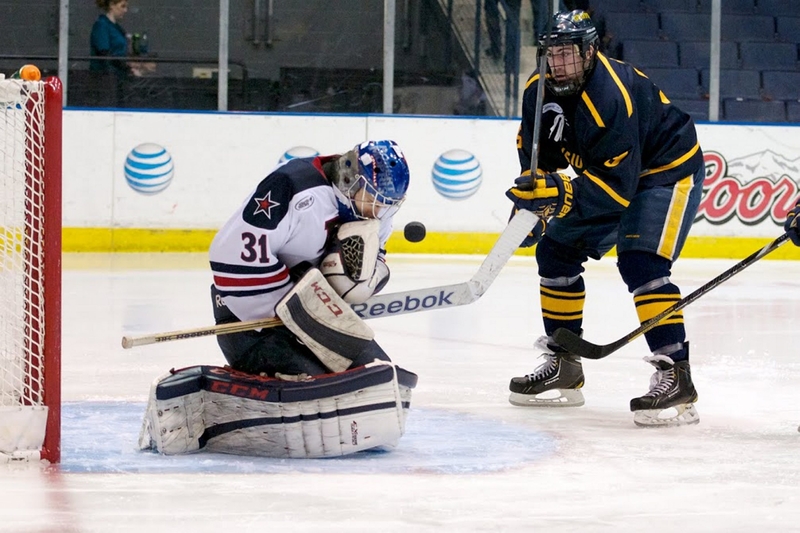 Robert Morris goaltender Dalton Izyk stops Canisius’ Taylor Law for one of his 27 saves Saturday at Blue Cross Arena. ROCHESTER — The dramatic, epic comebacks were bound to end at some point for the Canisius Golden Griffins. On Saturday, their rallies were answered at every turn by Robert Morris and the postseason run for the Griffs came to an end in a 7-4 loss to the Colonials in the Atlantic Hockey Championship game at Blue Cross Arena. Robert Morris earned its first conference title and the automatic bid into the NCAA tournament thanks to the beautiful offensive play of Cody Wydo and the solid play of freshman goalie Dalton Izyk. Wydo, the tournament’s most valuable player, netted a hat trick while Izyk recorded 27 saves. It was Wydo who had given the Colonials a 2-1 lead after 40 minutes and Izyk who stymied the Griffs’ quality offensive chances throughout the second period. But it was the wild third period and the ability of Robert Morris to respond after giving up a goal that sealed the title for the Colonials. Canisius tied the game, 2-2, just 1:16 into the third on a goal by Shane Conacher. Robert Morris regained the lead just 14 seconds later. The Griffs were then short-handed for five minutes as Ben Danford was called for a boarding major and a game misconduct. Canisius killed off the penalty but just as it expired, a Robert Morris rush ended with a goal by Matt Cope for a 4-2 lead. But, things were just getting started. Mitch McCrank brought Canisius back to one goal, 4-3, only to have David Friedmann score 37 seconds later. A power-play goal by Chris Rumble? Answered with a goal from Greg Gibson 29 seconds later. Wydo added a goal with 1:54 left in the game to complete his hat trick and give the Colonials the three-goal cushion. After a scoreless first period, the Griffs had plenty of scoring chances in the second period. Shane Conacher hit the goal post. Ralph Cuddemi had a great chance on a rebound. Mitch McCrank rushed in for a perfect opportunity. But they just couldn’t get the puck past Izyk. “With all those chances out there, the guy who doesn’t put the puck in the net is obviously a little frustrated but everyone else gets a little boost from that and we get going a little bit more and more every time that happens,” Rumble said. Capobianco finished with 26 saves, giving up five goals on 13 shots in the third period.